"She reassured me it was one of her cats." As an animal lover, Eric Hertlein’s grandmother naturally has a soft spot for the handful of stray cats who live around her home in Kansas. 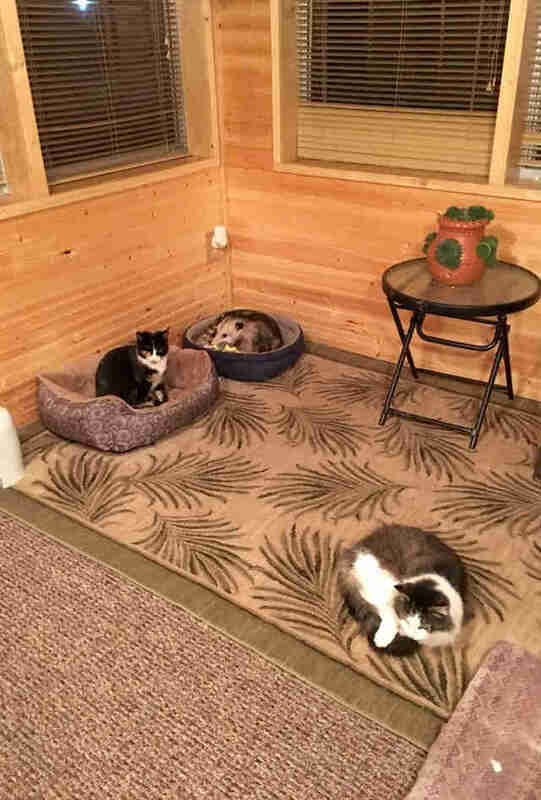 So much so, in fact, that she’s set aside a cozy place for them with beds and food on her enclosed porch. Occasionally, she even invites them inside the house. Little did she know, however, that one of the kitties she’s been caring for over the past couple of months isn’t a cat at all. 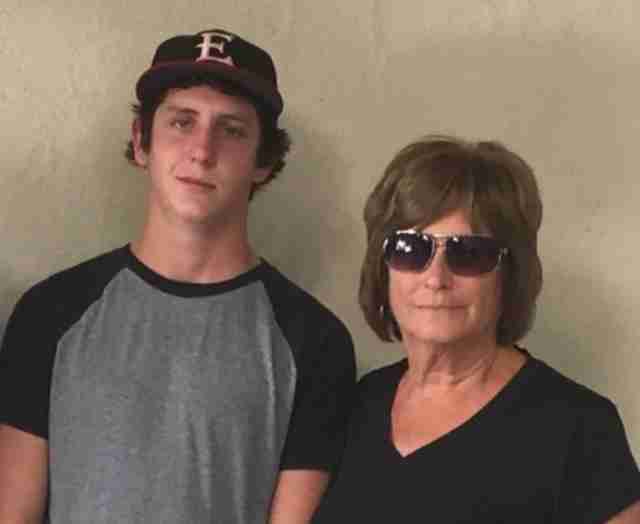 Recently, Eric decided to stop by his grandma's house for a visit. As he walked in, she was there to greet him, along with the typical array of strays who can usually be found lounging there. But then Eric's eyes landed upon something unexpected. 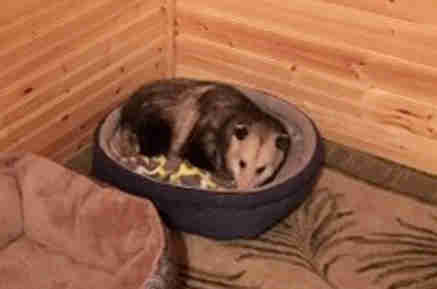 Snuggled up among the cats, in a bed all his own, was an opossum. Alarmed and confused, Eric assumed the wild imposter had just snuck in. His grandma, seemingly surprised by that reaction, sweetly tried to calm Eric's nerves. That "kitty" in the corner? He'd been coming around for a while now. She'd named him Tete. "She reassured me it was one of her cats,” Eric told The Dodo. "I told her it wasn’t what she thought it was." Now, it was Grandma who was confused. "I laughed for a good five minutes," Eric said. 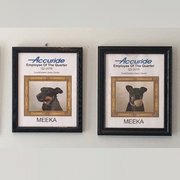 "She didn’t realize what I was laughing about until I started pointing out the pointy nose and skinny tail. She didn't realize he wasn't a cat." This all came as a shock to Eric's grandmother. She needed to see for herself. But her reaction upon learning the truth about dear Tete couldn't have been kinder. "She kinda just sat there," Eric recalled. "Then she got a little closer ... and slowly looked up at me with the biggest grin on her face and said, 'Well, he hasn’t bothered me yet, so I’m OK with him being here!'" Grandma has accepted the opossum — and interestingly, so too have the real cats hanging out at her place. None seem bothered by him, presumably having been aware of his true identity all along. It's unclear exactly how Tete came to end up with a cohort of kitties, but there's a chance he was orphaned. 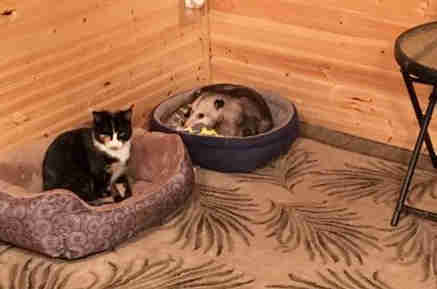 Eric came to learn later that the opossum was just a baby, then thought to be a kitten, when he first showed up to his grandmother's house looking for food and warmth. The fact Eric's grandmother welcomed him in then, and even now that she knows the truth, speaks to the power of kindness. "She loves animals and taking care of them whenever she can," Eric said. "It kind of just motivates you to do better and treat other beings better too."